Especially for patients in intensive care high blood sugar values mean even more mortal danger. Stress-hyperglycemia has caused more death cases than diabetes. And it seems to be the wrong way to bring down the level immediately with insulin. His family doctor never mentioned anything about the peril of diabetes. His blood sugar levels were just regular in all previous routine checks. And now all of a sudden in the hospital just prior to the surgery, the glucose level shot up to values of more than 200mg/dl – too much for a safe surgery. Situations like this are not rare cases in hospitals. 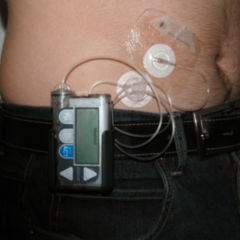 A diabetic who gets to enter the OR normally is fine-tuned well on his drugs. His risk for complications is just slightly higher. The problem child of a surgeon however is a patient suffering from a “stress-hyperglycemia“. He does not know anything about increased blood sugar levels in his daily life and is surprised when he learns about the lab results in intensive care. Such patients live a much more dangerous life that fine-tuned diabetics because those sudden and hefty fluctuations cause more concomitant diseases and a by far higher death rate. Often more than 90 percent of all patients in intensive care have more than 110 mg/dl glucose in their blood. If you deduct the positively diagnosed diabetics still more than half of the patients remain outside the standard blood glucose level. Patients with stress-hyperglycemia are distinguished from the actual diabetic by the spontaneous drop of their levels after their return to a “normal life”. 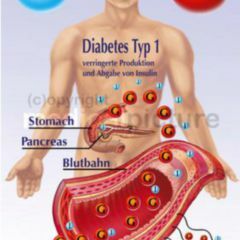 This does not apply for all affected, though, because about every third diabetic does not know about his disease. Thus the results of a small study made in New Mexico/USA are not coming as a surprise which predicts diabetes within one year for six out of ten hyperglycemia patients. Not long ago, physicians took high sugar production in stress situations as normal. Especially patients with life-threatening diseases often have troubles regulating their blood sugar level without having to be considered diabetics. 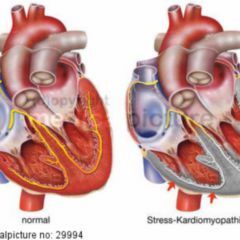 Despite several large studies on this topic it is not clear at all whether stress in general and during a disease can be marked as the root for the hyperglycemia or the disease impairs the fine-tuning with a general insulin-control. 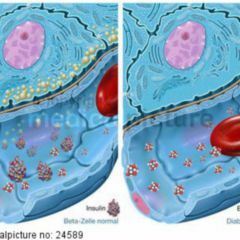 The typical type-2 diabetic deals with a combination of insulin resistance and a defect in secretion of the betacells. A whole arsenal of team-mates from hormones to messengers is involved in stress-hyperglycemia. Catecholamines, cortisol, growth hormones and quite a few cytokines play an important role here. Their team play leads to an excessive hepatic glucose production and an – often only temporary – insulin resistance which cannot stop an overproduction any longer. A current work published in the Journal of Medical Genetics also shows an inherited contribution in non-diabetics with a hyperglycemia caused by sepsis. A mutation in the promoter-region of the mitochondria-protein UCP2 is closely related to the increased sugar level. You live dangerous if you flood your blood vessels fast with glucose: Like Kathleen Dungan from Columbus/OH, USA and two of her colleagues are writing in a review for the “Lancet” they found a mortality 18-times higher for test persons with stress-hyperglycemia in comparison with the control group with regular sugar levels during a retrospective study with about 1,900 patients. The risk for patients with diabetes increased only about three times. A meta-analysis of patients after a stroke made in 2001 came up with similar results as well: Compared with diabetics, patients with “sudden” hyperglycemia had a triply elevated death rate. But not only death rates unveil the risks of stress-hyperglycemia. A new study in Amsterdam reports of a strikingly high rate of deep vein thrombosis in patients with high blood sugar without diabetes. Lab experiments show that the glucose is not only associated with the vein thrombus but is also involved in its formation. It therefore is certain that in particular during such unexpected highs a blood sugar regulation curbs the peril. Greet van den Berghe, Löven/Belgium, published as early as in 2001 the advantages of an intensive insulin therapy lowering morbidity and mortality significantly in the New England Journal. This applies – looking back at the then study – particularly for long-term hospital patients. Whereas short-term stays in hospitals indicate a conservative insulin therapy more successfully than a rather strict one. In an additional publication in the renown medical journal van den Berghe showed that target values of 190-215 mg/dl contribute a whole lot more to a reduction of mortality than the effort to reach “normal levels” of 80-110mg. The German VISEP-study at 18 centers with about 500 sepsis patients fine-tuned on insulin was discontinued by the people responsible due to frequently occurring hypoglycemia. In spring this year, the “NICE-SUGAR“-study with more than 6,000 intensive care patients finally confirmed the advantages of insulin therapy not clinging too tightly to low values.